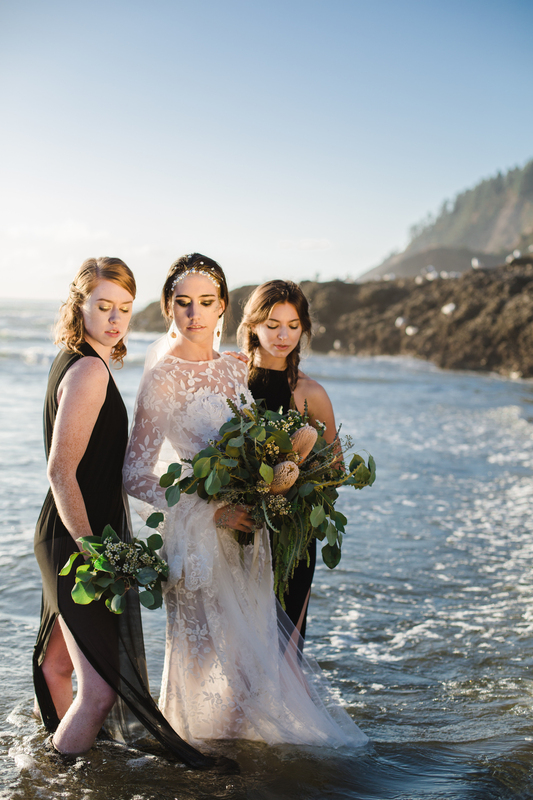 A few months ago I had a crazy idea for a bridal shoot on the Oregon Coast. This was something a little different from the norm and it would require a lot of creative effort from a lot of people. After putting a model call for a "mermaid inspired bridal shoot", I received tons of inquires to be involved in this project. It was because of this massive amount of talent I came across, I realized I couldn't just have ONE model, but I went the Macbethian route and decided upon three models, or three siren sisters. The Power of Three is a huge and important theme across so many fiction stories and novels, and since my inspiration was mostly mythological, it seemed appropriate to have three beautiful sirens. During my hunt for models, I reached out to a few vendors to get involved. I needed a cake, flowers, and some jewelry. As luck would have it I connected with three of the best vendors on the west coast. Delectable Baked Goods with the cake design, Seventh Stem for the bouquets, and NAUPAKA Store with the earrings. However, there was one creative mind that made this project come together perfectly, and that is the makeup artist Gina Campbell. After giving her some pinterest images of what I liked, Gina created three seductive sirens out of three beautiful models. She came with us to the beach and helped with touch ups, set up, and gave the girls amazingly glittery feet as a final detail. During the four hours we had on Indian Beach, we were constantly moving around to find different shots and locations in the area. We were in an out of the frigid ocean water, freezing our legs and bodies off. What we finished with was nothing short of magic, and I am forever thankful for the hardworking ladies on this project. I hope you enjoy.